Chak Motors is touting their Molot (Russian for sledge hammer) superbike as being the safest bike in the world. The Russian company’s mission statement is safety ,technology, design and craft and their hand built Molot certainly stands out as a future trend setter. This high-tech “safe motorcycle” started its life as a 2013 Honda CBR1000RR ABS, but Igor Chak, founder of the firm gave it complete makeover. Not only did he makeover the bike, he culled safety features and technology from the automobile world, in order to make even the most distracted motorcycle rider feel a little safer in surrounding traffic. 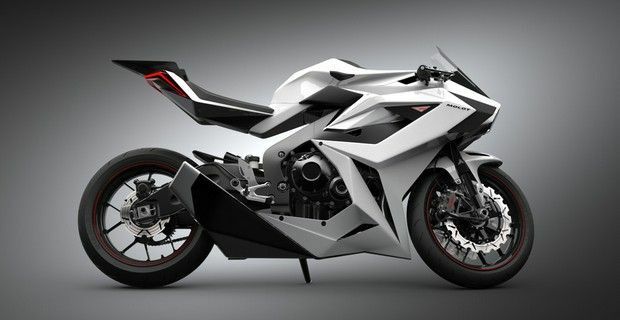 The aggressive, aerodynamic and edgy looking Molot has had its frame modified to give the motorcycle a lighter look and houses a 999.8cc liquid-cooled inline 4-cylinder engine with DOHC layout and mated to a 6-speed gearbox and is equipped with a small lithium-ion battery, instead of a standard one. Chak has abundantly used carbon fiber, aluminum and composites, to be make the Molot even more ultralight, and 5% of all the parts in metal and plastic on the motorcycle have been manufactured using 3D printing technology. The Molot is chock full of safety features starting with the LED light system. Headlights (high, low beams), blinkers, taillight are all LED to make you more visible, and this includes daytime running lights in the headlight and on the side mirrors. They’ve also added the Predictive Emergency Braking System (PEBS) with two radars up front, one short range and long range and an HD camera that is mounted in the headlight that will send you messages on your dash and handlebars advising that you might be getting too close for comfort to a possible obstacle, thus helping you avoid a collision. The PEBS will also take control of your brakes and apply full pressure to stop the bike to avoid a collision in case a car suddenly brakes in front of you and if you fail to react, and since the Chak Molot is equipped with anti-locking brakes (ABS), the rider will not lose control of the bike. Another nifty feature is the Lane Departure Warning System(LDWS), which is a valuable backup for people who tend to forget to check with their mirrors before changing lanes and this feature also gives a pulse vibration to the handle bars. The system is disabled when you turn on your turn signal. The bike also detects blind spots through sensors mounted in the rear cowl, and it also features a gyroscope safety cut off system that detects anomalies in vibration and control that will disable the throttle (this feature can be disabled). The rear cowl also houses electronics and a USB port for charging smartphones and a front-facing HD camera records everything 24/7 and stores the images on an onboard HDD. Rumors have it that the Molot will cost around $75,000, and be released some time in 2015.